Auto technology developer Harman has announced the first successful commercial implementation of Apple's CarPlay interface from an iPhone without the use of a wire. Until now, use of Apple's car-supported software required attaching a smartphone via a Lightning cable to the USB port of the vehicle's dashboard. This new method replaces the cord with Bluetooth connectivity, a feat Harman claims is a first in the connected car industry. From there, the system uses Wi-Fi to beam data back and forth, potentially turning hooking up your iPhone to your car as seamless as stepping into the driver's seat - not to mention frees up that USB slot for some other device that may need charging. Apple CarPlay works as an app which can be installed on compatible vehicles to allow iOS-style control over music, navigation and messaging through a car's dashboard. CarPlay also enables Siri controls for the car, allowing drivers to adjust their tunes or make a call with the help of the digital assistant while keeping their hands on the wheel and eyes on the road. While we're all for making things easier for our daily commute or occasional road trip, wireless CarPlay has been a long time coming. Apple first announced it would bring wireless functionality to the auto app back at WWDC 2015, with automakers (as well as Apple) being a little slow to push the technology out. 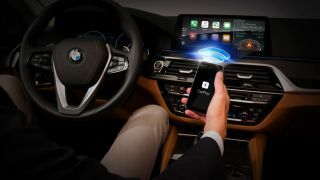 Better late than never, however, as Harman adds its wireless technology is already being deployed in cars by "a luxury German automaker" - almost certainly referring to the 2017 BMW 5 Series, which will be among the first vehicles on the road to have wireless CarPlay connectivity, according to The Verge.